A Federal High Court has ordered the Independent National Electoral Commission (INEC) and its chairman, Mr Yakubu Mahmood, to appear before it to show cause why they should not be committed to prison for contempt. This followed the ruling by Justice Stephen Pam who dismissed a preliminary objection filed by the INEC chairman and the commission challenging the contempt suit brought against them by the Ejike Oguebego faction of the Peoples Democratic Party (PDP) in Anambra State. The trial judge in dismissing the application discountenanced the position of the INEC chairman that the contempt suit against him amounts to forum shopping and an abuse of court process because there is a similar suit pending in the Federal High Court on the same subject matter. But According to Justice Pam, the filing of two suits cannot be classified as tantamount to abuse of court proceedings, it is filling the same application with different suit numbers that constitutes an abuse and forum shopping. 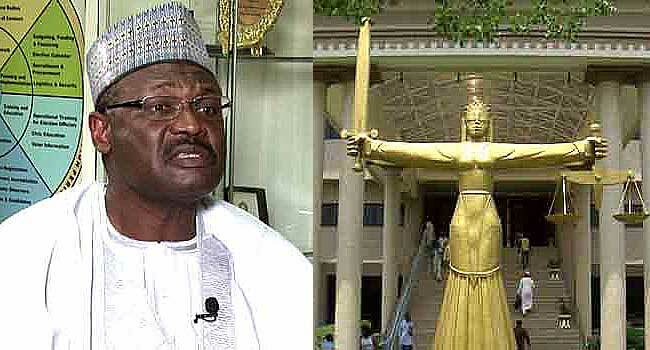 On the second reason adduced by the INEC chairman that the tenure of the applicants has elapsed Justice Pam held that the INEC chairman has not placed any material evidence before the court to prove its assertion that the tenure of the applicants had elapsed to say that they have no locus standi to file the suit. He added that in any case, the tenure of office is hardly relevant in a case as serious as that of contempt. The trial judge concluded that the preliminary objection fails in its entirety and is dismissed. He also ordered the INEC chairman and the commission to appear before it at the next adjournment to show reasons why they should not be committed to prison.